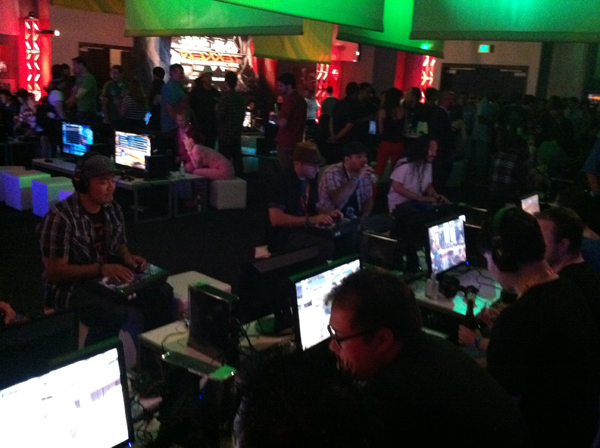 We were lucky enough to be invited to the Namco/Microsoft Tekken Tag Tournament 2 After Party this past Saturday night at the Hard Rock Hotel. 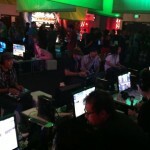 At the party Namco showed off a new build of Tekken Tag Tournament 2 that featured the online play. 8 stations were setup in a network (so it was always 5 bars) and we would be randomly assigned opponents as if we were online. For the most part, lag was non-existant, but again its 5 bars on a local network, so its pretty much expected. Hopefully this bodes well for the online play going forward though! Best feature = mini practice mode between matches! Also, when connecting to an opponent it shows their disconnect rate! I recorded two short clips that show some of it in action – check it out after the jump and remember that this build is a work in progress. Interested in what Namco has in store for everyone with Naruto, Soul Calibur 5, and all things Tekken? This is their full panel from Comic-Con, broken up by game. Announced today during Namco’s panel at Comic-Con, there will be a demo of sorts for Tekken Tag Tournament 2 included on the disc in addition to the movie Tekken:Blood Vengeance and Tekken Tag Tournament 1 HD. For TTT2:Prologue There will be character models exclusively FROM the Blood Vengeance movie (Devil) as well as most characters from the movie as well as a handful of stages (Snow Castle/School stage shown). The game will have the ‘full game system’ of Tekken Tag Tournament 2.